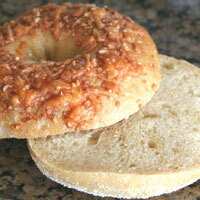 We love these bagels for sandwiches or just to eat by themselves. They can be made in a few hours, and they freeze well. Knead all ingredients for 10 minutes. 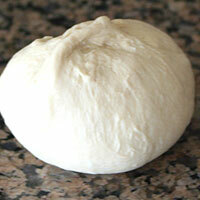 If you are adding any mix-ins, add them the last few minutes of kneading. Cover and rise 1 hour. 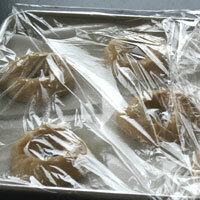 Line a jellyroll pan with parchment paper of foil. Spray lightly with cooking spray. 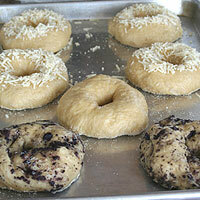 Divide the dough into 8 equal pieces (2.6 oz each). 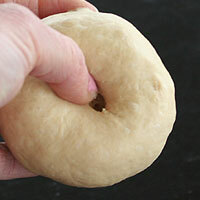 Form into a ball by pushing the dough into the center with your thumbs. 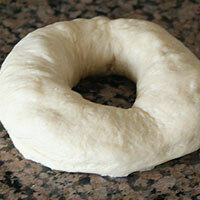 Continue to bring any rough edges into the center until the dough is round and has a tight, even skin. Pinch at the bottom to seal. Place seam side down and continue with the rest of the pieces. When they are all formed start creating the holes. Push thumbs into the center and pull evenly to create a hole 1-2 inches across. The hole will shrink when it rises. When all the bagels are fomred cut the parchment into individual pieces. This makes it easy to drop the bagel individually into the boiling water. Cover and rise 30-45 minutes. How it looks fully risen. Heat oven to 400. Boil a large pot of water and add 2 t salt. Pour semolina or cornmeal on counter. 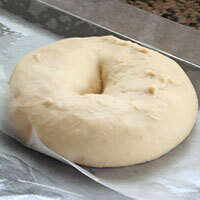 Pick up one of the parchment pieces with bagel on it and gently place it in the water. Boil 20 seconds. Flip and boil 20 seconds more. If your oven takes a long time to preheat, start it well before begining the boiling process. 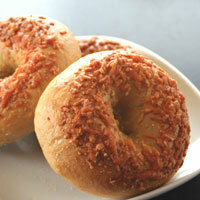 The bagels need to be baked as soon as they are done boiling, so you'll want your oven to be ready. Place on a cooling rack to dry while you boil the rest. 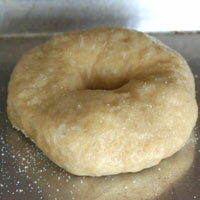 Set each bagel in the semonlina or cornmeal and coat the bottom well. 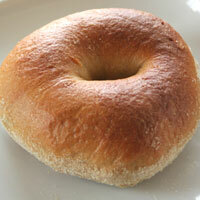 Place on pan and continue with the rest of the bagels. Be sure the bottoms are coated well with the cornmeal or semolina or they will be very stuck to the pan. Don't spray the pan with cooking spray, it burns the bottoms of these. If adding toppings, do so now. 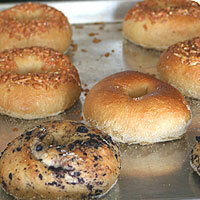 You can bake a variety of bagels on one tray. As soon as they are all boiled (and topped is desired), bake 23-25 minutes until golden brown. If they sit too long after boiling and before baking they will not fully rise in the oven. The boiling/drying/cornmeal/topping process takes 5 -10 minutes, so you don't have to work too fast. Just try to get them in the oven in 10 minutes or so. Cool completely then slice for sandwiches or fillings. They are best the first day they are baked. I like to slice and freeze the rest. They are best the day they're made. They do freeze well. I like to cool, slice, and freeze them. Even if I plan to use them the next day they are best stored in the freezer. Defrost at room temperature 1 hour or 20-40 second in the microwave. 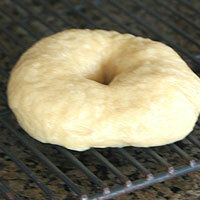 Be sure to let the bagels dry for a little while (30-60 seconds) on a rack before coating the bottoms with semolina. This get excess water off. If the water stay on, even with the cornmeal, they stick strongly to the pan and they will be ruined trying to pry them off. 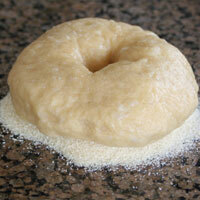 Be sure to coat the bottom thouroughly with cornmeal or semolina after drying. 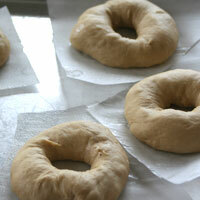 Bagles need a bit more flour than most bread doughs. Too little flour will make them fall flat. I like to double it, just keep in mind you can only bake one pan at a time because they take up a lot of room. This means you have to raise, boil, and bake them in two different stages. 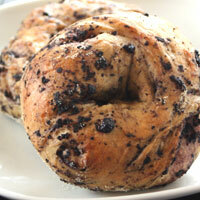 Follow the recipe for plain bagels. 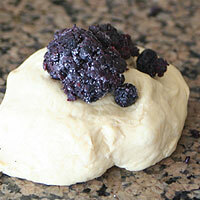 Add blueberry mix-in the last few minutes of kneading the dough, then follow the same process. 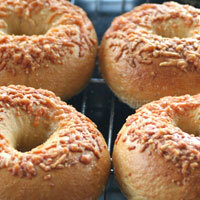 Follow the recipe for plain bagels. 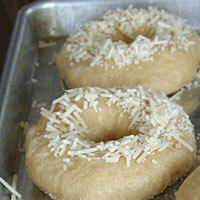 After boiling and coating the bottoms with semolina, place on the baking sheet and top with cheese. Each bagel should get about 1 T. Follow the baking instructions. 1. Knead all ingredients for 10 minutes. 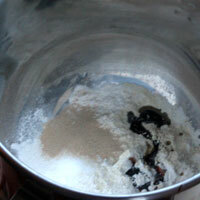 If you are adding any mix-ins, add them the last few minutes of kneading. Cover and rise 1 hour until it doubles in size. 2. 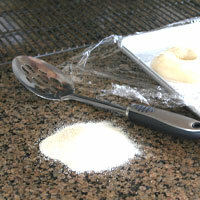 Line a jellyroll pan with parchment paper of foil. Spray lightly with cooking spray. 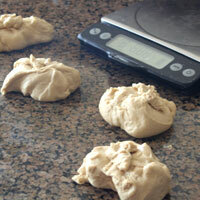 Divide the dough into 8 equal pieces (2.6 oz each). 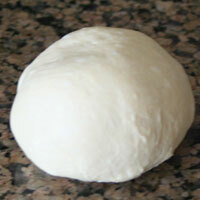 Form into a ball by pushing the dough into the center with your thumbs. 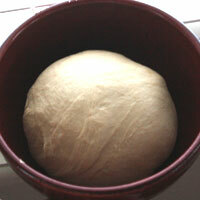 Continue to bring any rough edges into the center until the dough is round and has a tight, even skin. Pinch at the bottom to seal. Place seam side down and continue with the rest of the pieces. 3. When they are all formed start creating the holes. Push thumbs into the center and pull evenly to create a hole 1-2 inches across. The hole will shrink when it rises. Place on prepared parchment. When all the bagels are formed cut the parchment into individual pieces. 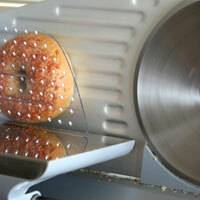 This makes it easy to drop the bagel individually into the boiling water. 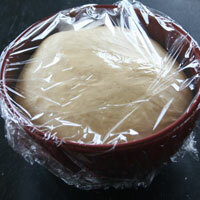 Cover and rise 30-45 minutes. 4. Heat oven to (1)400. 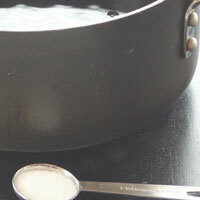 Boil a large pot of water and add 2 t salt. Pour semolina or cornmeal on counter. 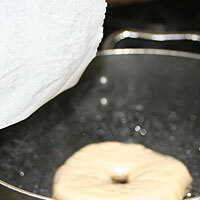 Pick up one of the parchment pieces with bagel on it and gently place it in the water. Boil 20 seconds. Flip and boil 20 seconds more. Place on a cooling rack to dry while you boil the rest. 5. 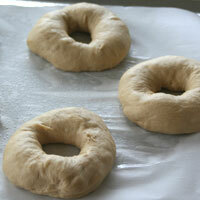 Set each bagel in the semonlina or cornmeal and coat the bottom (2)well. 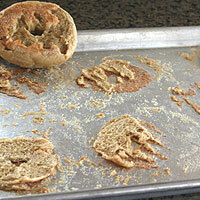 Place on ungreased pan and continue with the rest of the bagels. If adding toppings, do so now. You can bake a variety of bagels on one tray. As soon as they are all (3)boiled (and topped is desired), bake 23-25 minutes until golden brown. Place on a rack to cool. Serve or slice and serve. -They are best the day they're made. -They do freeze well. I like to cool, slice, and freeze them. Even if I plan to use them the next day they are best stored in the freezer. -Defrost at room temperature 1 hour or 20-40 second in the microwave. 1. If your oven takes a long time to preheat, start it well before begining the boiling process. 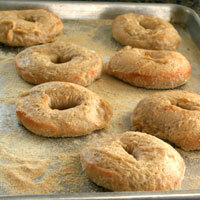 The bagels need to be baked as soon as they are done boiling, so you'll want your oven to be ready. 2. Be sure the bottoms are coated well with the cornmeal or semolina or they will be very stuck to the pan. Don't spray the pan with cooking spray, it burns the bottoms of these. 3. If they sit too long after boiling and before baking they will not fully rise in the oven. The boiling/drying/cornmeal/topping process takes 5 -10 minutes, so you don't have to work too fast. Just try to get them in the oven in 10 minutes or so.